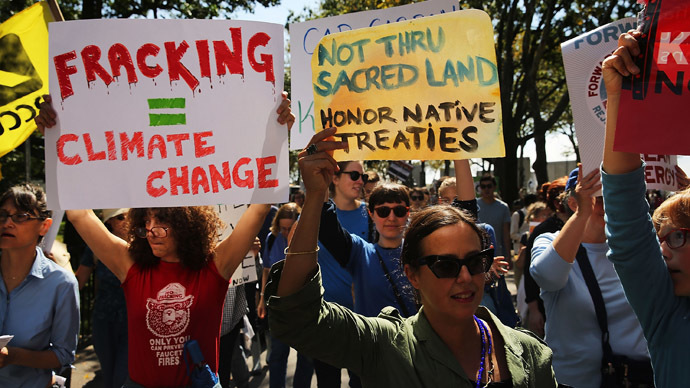 Activists from 26 countries are taking to the streets on Saturday to protest fracking technologies that extract hydrocarbons by pumping pressurized chemicals underground. They say fracking contaminates groundwater and hastens climate change. 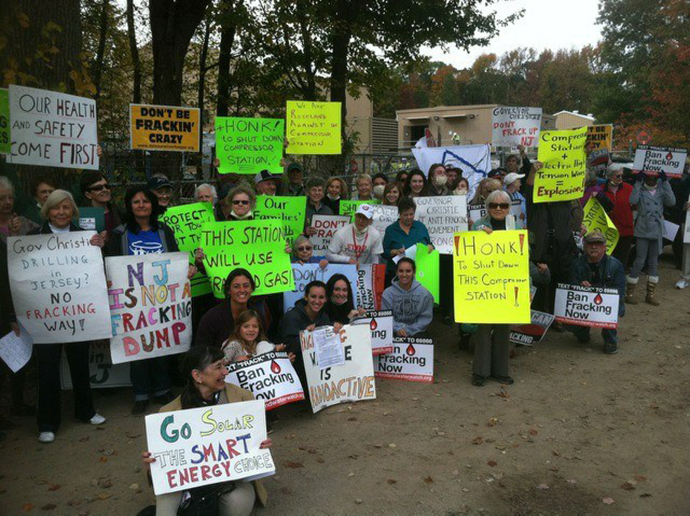 01:45 GMT: Demonstrators gathered in Roseland, New Jersey, holding signs saying: "NJ is not a fracking dump." 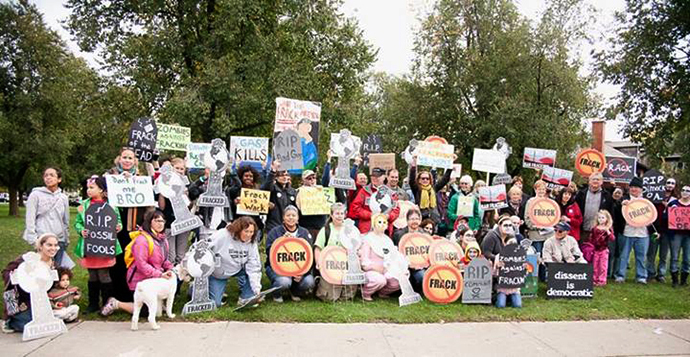 01:34 GMT: Around two dozen protesters demonstrated on Global Frackdown day in Buffalo, New York. Activists gave speeches, played music, and held signs. 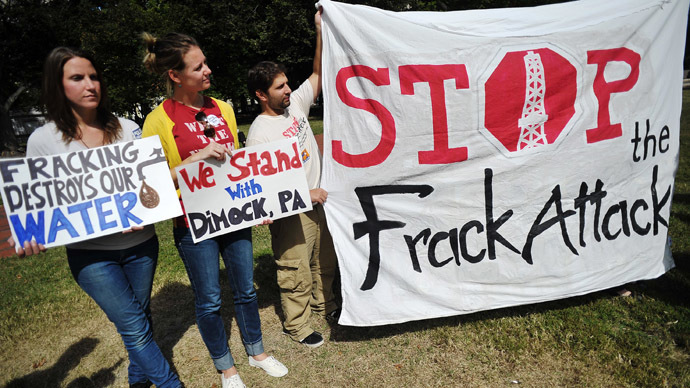 01:32 GMT: Ohio’s Greenfield Township joined in the global protest against fracking. 22:03 GMT: Residents of Pittsburgh, Pennsylvania stand in solidarity with Canada's Elsipogtog First Nation, which is protesting against fracking. 21:13 GMT: Demonstrators gather near Raritan River in New Jersey, US to take part in the Global Frackdown action. 21:09 GMT: Activists in the US state of California participate in the march and a bike event to protest against fracking near Ballona Creek. 20:52 GMT: Canadians along with the Elsipogtog First Nation gather in Rexton, New Brunswick to demonstrate against fracking. Five of the protesters reportedly seized a news vehicle and a camera, according to local media. 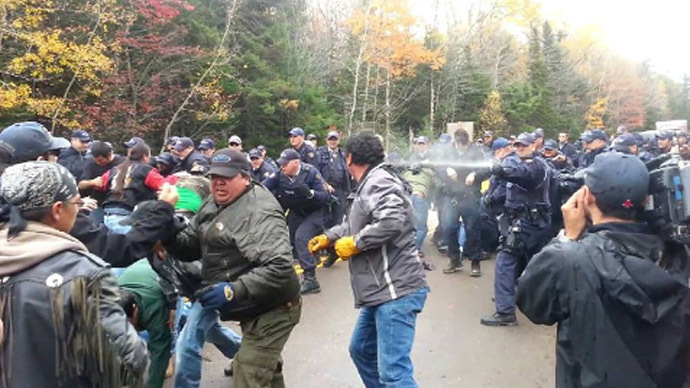 Earlier on Saturday, protesters blocked Highway 11 near Rexton. 19:40 GMT: The locals in the Romanian village of Pungesti, who protest against plans by US energy giant, Chevron, to drill for shale gas in the area, say they are ready to fight against fracking till the end for the future of their children. “We hope to stop them, even if it means paying with our lives; even if they want to send the army, we will die if it is fated for us to die, so let it be. But we won’t give up until they outlaw fracking in Romania,” one of the locals told RT. “I am so afraid of this kind of gas exploitation. People say there will be big problems for our animals because the water will be affected. And the soil and the food for animals and for us and our children as well. We have children and grandchildren,” another villager added. 17:51 GMT: WWF Scotland has welcomed the new policies by the country’s government, aimed at protecting communities from controversial energy projects. The new Scottish planning policy, which comes into force next year, reinforces the need for environmental and community protection when considering projects to extract oil and gas by unconventional methods. In addition, it will introduce the need for an “adequate” buffer zone to be established around any such projects, and make clear that the planning system must “minimize the impacts of extractions” on communities. 17:03 GMT: An anti-fracking rally took place in the city of Kerch at Ukraine’s Crimea peninsula as several activists gathered in front of a gas station, owned by Anglo–Dutch multinational oil and gas company, Shell. The campaigners, wearing gas masks, warned that the company, which received permission to explore shale gas from the Ukrainian government, possesses threat to the country’s ecology. 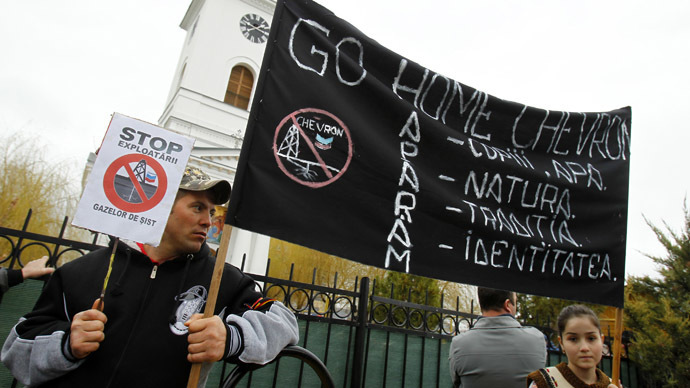 16:47 GMT: Around 1,000 protesters rallied in the northeastern Romanian village of Pungesti against plans by US energy giant, Chevron, to drill for shale gas. The protesters, including people in national dress, chanted "Chevron, go home" and "We say no to shale gas." The company suspended activities in the region after three days of protests, but villagers have continued to occupy the site where the company plans to drill its first exploration well. "We have won a battle, but not the final victory. I want my seven great-grand-children to grow up in a safe environment," 88-year-old protester Emil Dobarteanu told AFP. 15:05 GMT: Fracking is more widespread and frequently used in the offshore platforms and man-made islands near some of California's most populous and famous coastal communities than state officials previously believed. Off the shores of Long Beach, Seal Beach and Huntington Beach — some of the region's most popular surfing and tourist areas — oil companies have used fracking at least 203 times at six sites over the last 20 years, according to interviews and drilling records obtained by The Associated Press through a public records request. There is currently no evidence that offshore hydraulic fracturing has led to any spills or chemical leaks in the region. The practice, however, has occurred occurs little state or federal oversight of the operations. 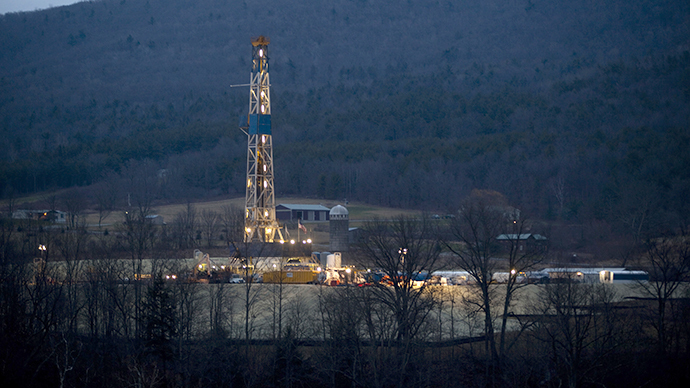 Amidst an ongoing state investigation into the extent of fracking in both federal waters and those closer to the California coast, environmental groups have called for a moratorium on the practice until a law increasing oversight of fracking takes effect in 2015. 14:50 GMT: American Against Fracking say there are currently 250 different actions in 30 countries for the #globalfrackdown on Saturday. 13:35 GMT: Anti-fracking protesters from all over Romania have been galvanized US energy giant Chevron’s plan to start drilling outside the village of Pungetsi. While the energy firm has Bucharest’s blessing, people have come together to take a stand against the potential health and environmental risks of hydraulic fracturing in the region. “Lord Browne was former BP oil chief and is now head of the fracking firm Cuadrilla, which started drilling in Balcombe this summer resulting in huge anti-fracking protests,” the group said. The UK-based group, comprised of young people aged 18-30, protested outside of Riverstone House, an energy and power-centered private investment firm where Lord Browne is a key partner. 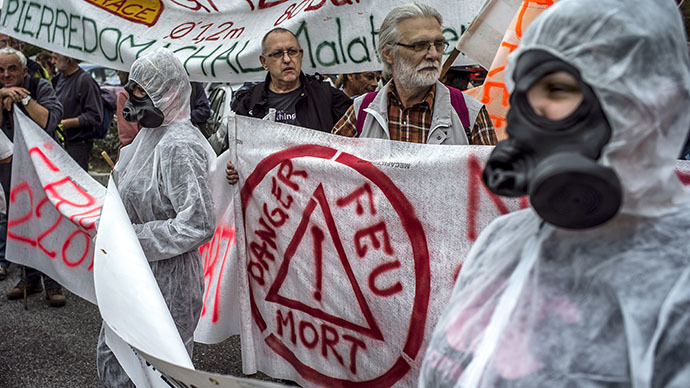 Amazing #globalfrackdown actions already in Spain, France, Romania, UK. Its on! Follow us and @foodandwater for tweeted photos. 11:30 GMT: The benefits of hydraulic fracturing in terms of job creation and meeting energy demands have been drastically exaggerated, while the consequences of the controversial practice could prove cataclysmic, geopolitical commentator Ian Crane told RT. Crane says that while only a minute number of jobs will be created over the next two days as a result of fracking, the ecological consequences will be far graver. 10:45 GMT: Anti-fracking activists are gathering in London. They are going to picket Lord John Browne’s company, a businessman and advisor to the UK government, who champions the idea of 'dash for gas'. “We're now writing messages to Lord Browne asking him to resign from the cabinet office and stop fracking our future,” the protesters tweeted. At least 13 separate protest gatherings are scheduled for Saturday in UK cities, including Belfast, Glastonbury, Manchester and Preston. 09:10 GMT: An online petition calling on the Royal Canadian Mounted Police, which used pepper spray and tear gas against First Nations anti-franking demonstration, to pledge it will not use excessive force against peaceful protest, has been signed by over 21,000 people since its publication on Friday. 05:56 GMT: Developing fracking technologies and extracting previously inaccessible hydrocarbon reserves is the absolutely opposite direction to where the world should move, environmental activist Rose Braz told RT.